Bird Books – Don’t Leave Home Without ’em! Yesterday Neighbor Liz and I went to volunteer at a Hummingbird Festival at a local nature center. The festival is planned to be at the average date of peak hummingbird migration, but you never know if the hummingbirds will cooperate. This year I think I saw about a dozen flying around, probably all Ruby-throated Hummingbirds. Last year I worked the Wing Span station and that was fun — there was a big banner with the wingspreads of various birds outlined on it, and people would get in front and take pictures comparing their reach to the albatross, great blue heron, eagle, etc. And then we would have the kids flap their arms for 10 seconds and tell them what bird their flap rate compared to. So I requested to be put at that station again. I remembered that last year people asked us questions about all kinds of birds, and we didn’t have any reference materials to help us answer them, so this year I brought along my two favorite bird books* and also my personal bird notebook, where I have pictures of the birds from our farm (which you can see on my page Species List). We have to walk in about a mile from the parking lot to the festival site, but I was pretty sure carrying all that extra weight would be worth it. When we got to the festival,the first thing we did was head to the Free Book table. This started a few years ago, when the park needed more storage space, and put all their old donated books and back issues of birding magazines out for people to take home. It was popular and so regular volunteers brought their donations to repeat it the next year. Now I think people just bring back whatever they took home the year before, but there are hundreds of books and magazines available. Liz got some brand new Audubon guides, and I picked up two books from the 1950s. I love those old illustrations and some day I will wallpaper a room with them. As visitors started arriving, we reluctantly left the book table, but we couldn’t find our station, because there was no big bird banner! The nature center people said it was too much trouble to put up. So all we had was some measuring tapes and some printed pages about 12 different birds – without even their wingspans listed. So — Bird Book Save #1 — Liz and I looked up the wingspans and wrote the information on the pages, and arranged them by size and taped them down to the tables. I will probably always remember them now, because we referred to them all day long. The next issue was that the wingspans on the prepared printed material went from American Robin at 15″ to Peregrine Falcon at 41″ to Osprey at 63″. The younger kids measured about 26″ – 36″, and the older ones came in between 48″ and 58″. They wanted to see a bird they would match exactly. Bird Book Save #2 and #3- we looked up birds to fit those measurement and discovered that Green Herons have a wingspan of 26″, and Red-tailed Hawks range between 42″ and 60″, so we could find a match for each kid. As a weaver, I have long known that your reach is about the same measurement as your height (I have estimated how many yards in a piece of fabric many times by stretching it from the tip of my nose to the tip of my fingers), but most of the people who came by the booth had never heard that. We measured lots of kids but also lots of adults. The best one was this really huge guy who had to stay crouched down with his arms outspread for like five minutes while tiny Liz tried to reach up to measure him. His span was 80″ which put him in the Bald Eagle category, one of only three all day. Then they start to realize it is hard, and they start getting creative, making figure 8s, or just paddling in front, or waving from side to side — everyone does it a little differently. A photo montage of all their faces would be a cheerful sight. Most people can manage about 25 flaps in 10 seconds — coming in somewhere between crows who do 20 and pigeons do 30. We ask them if they think they could really do it for any longer than 10 seconds, and then we can talk about the birds that have to fly across the whole Gulf of Mexico when migrating, or about birds’ hollow bones, or about how birds have different patterns of wing flaps. During the day I was able to sneak off for a minute to take pictures of the live birds at the Audubon table. These are birds that were injured and cannot be returned to the wild, so they are brought out to educate people. 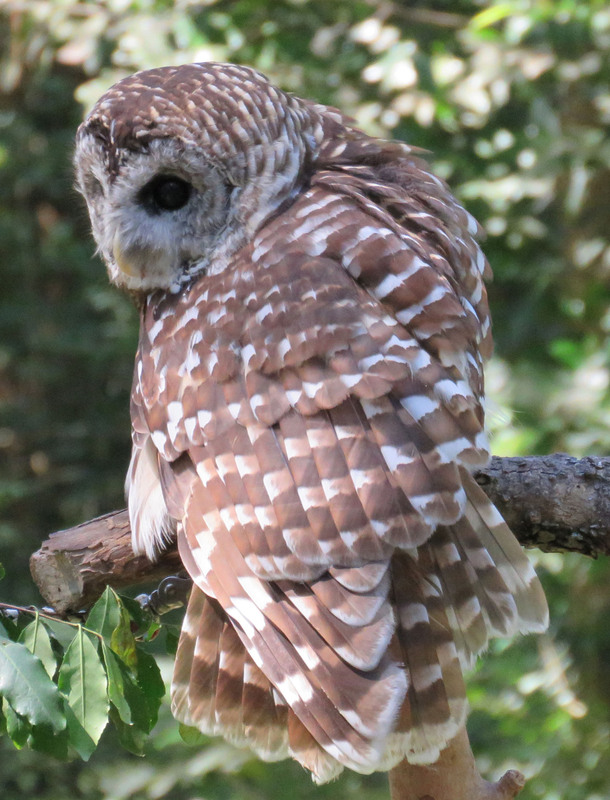 I didn’t hear her story, but this Barred Owl only has one wing. 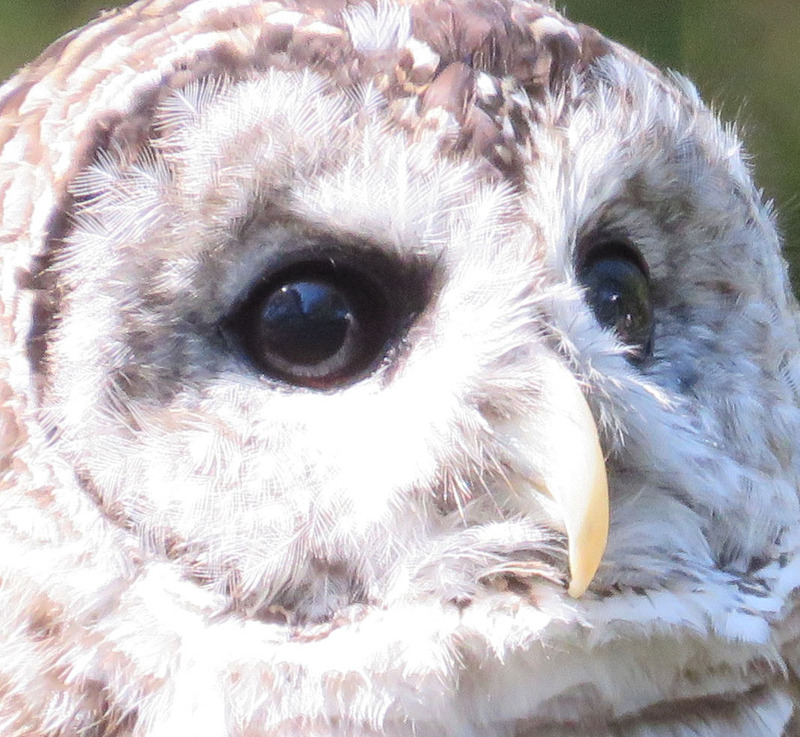 Barred Owl, rescued but having to live out her life in captivity. 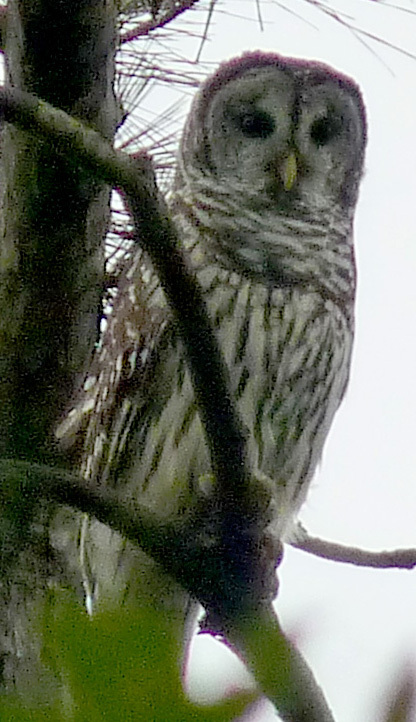 And here is the Barred Owl I have seen at our place. I have heard it pretty often, but I only saw it the one day, and I was so glad it stayed still and let me get lots of pictures. The Audubon lady showed this Great Horned Owl which was found in the road. They think he was on the roadway after a mouse, and got hit by a car. His wings just don’t work, he can’t flap them. He was one year old then, and now he is 26! He has been educating people a long time. 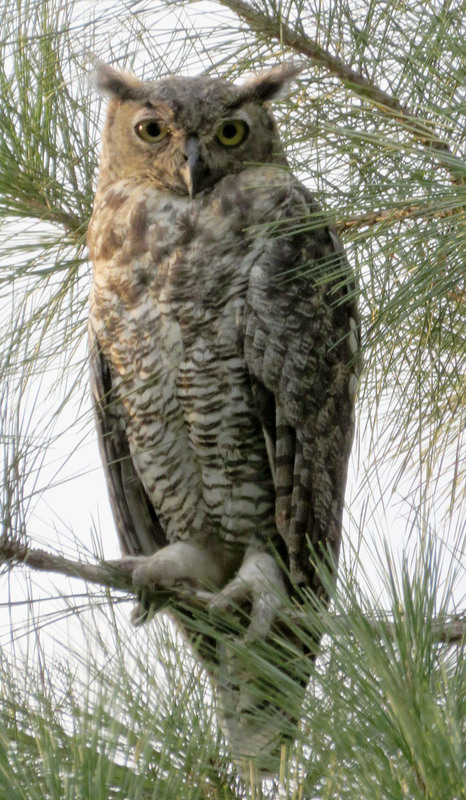 This year I have seen a pair of Great Horned Owls here at home, on five or six different days. I learned from the Audubon speaker that Barred Owls and Great Horned Owls are mortal enemies, and that Great Horned Owls displace the Barred Owls! 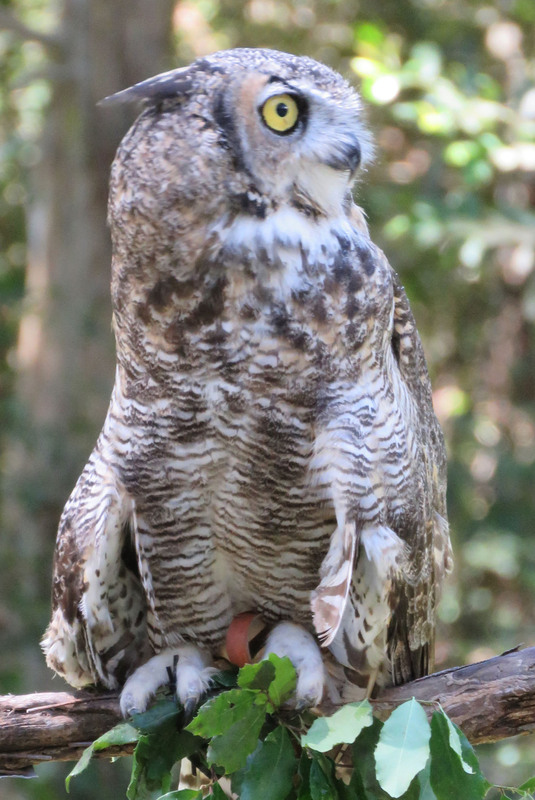 One of a pair of Great Horned Owls that live in our area. 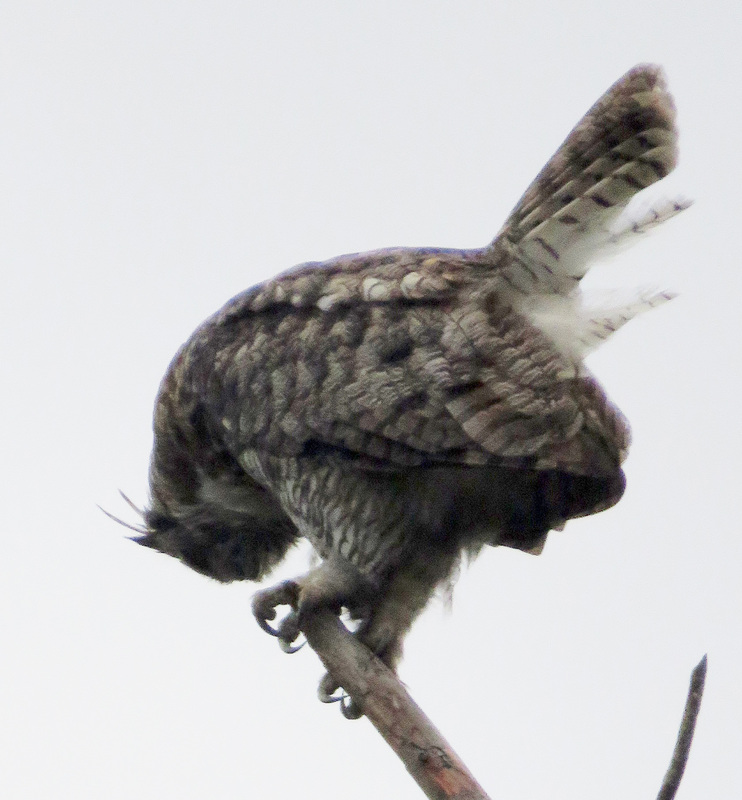 I don’t know if they always do this, but on this day, every time one of the owls hooted, it bowed over like this. We had been out in the 92 degree heat all day, and we were ready to go. We had both managed a few more minutes of browsing the Free Books table, and we each had a grocery bag full. Along with the books I had brought in, it was a long, heavy-laden trip back to the truck. But we had helped people learn a little more about nature and we had learned some things ourselves. It was a great day! *Bird books are like children; you are not supposed to have favorites. But the two I carry when space is limited are Birds of Texas by Keith A. Arnold and Gregory Kennedy, (because it limits the list of birds I might be seeing so I don’t have to search pages and pages) and (please put your hand over your heart) National Audubon Society’s The Sibley Guide to Birds. What a fun day! I love the wing-flapping exercise as a teaching moment – it opens up so many conversations. My aunt – who is a committed and serious birder – gave me her old copy of Sibley’s when I was there this summer. I do feel very superior about having it, even though it’s the *only* bird book I have, and I haven’t used it to identify anything more exciting than a goldfinch. I have a ton of bird books plus two apps and I end up using them all to try to make an ID. Just this year I realized that the reason I had not been able to ID two mystery birds was that I had been looking at the wrong families. It was a fun day at the festival – I really like trying to make sure that everyone that comes to the table has a happy moment. So many people come out alone, and then there are groups of kids with their Big Brothers and Big Sisters who are trying to introduce the kids to nature, or really frail old people who are bravely putting up with the heat and the uneven ground just to have a day out to see birds in company with others. I enjoy working the festival every year.